IN THIS BUSY LIFE WE'RE ALWAYS MOVING SO FAST, WE'RE LOOKING TO BUILD BRANDS AND DIVE INTO PROJECTS. WE HAVE IDEAS AND NEED A SPACE TO EXECUTE THEM! OR MAYBE WE'RE TRYING TO IMPROVE OUR PROFESSIONAL SKILLS AT WORK AND WANT TO ADD TO THE RESUME! NEVERTHELESS, IT CAN BE OVERWHELMING AT TIMES TO THINK ABOUT TAKING LEAPS TO PURSUE OUR PASSIONS AND INTERESTS. BUT I PREFER TO THINK OF THESE WAVES OF EMOTION AS AN ESSENTIAL PUSH AND PULL TO GIVING US THE ENERGIES WE NEED TO CREATE SOMETHING COMPELLING OR HELPFUL TO OTHERS. SINCE STARTING LIFEONAMAT.COM, I'VE DONE A LOT OF SOUL SEARCHING AND I'VE PUT SO MUCH EFFORT INTO MY WEBSITE AND THE POSTING SCHEDULE. BUT IT DIDN'T HAPPEN OVER NIGHT! BEING A CREATIVE REQUIRES DETAIL AND PLANNING. BEING A YOGA INSTRUCTOR / FULL TIME EMPLOYEE HAS ALSO PUSHED ME TO BECOME MORE ORGANIZED AND EFFICIENT. AND ON TOP OF ALL THE BUSINESS AND BEHIND-THE-SCENES TASKS, WE ALSO NEED A GENUINE AMOUNT CONTENT AS WELL AS THOUGHT-WORTHY PROJECT MATERIAL! IF YOU BELIEVE IN QUALITY OVER QUANTITY, THEN I'M SPEAKING TO YOU. IN TODAY'S SOCIETY, THERE'S SO MUCH PIXEL AND IMAGE SPAM FILLING OUR MINDS WITH WHAT WE THINK WE SHOULD DO. IT CAN BE OVERWHELMING WHEN YOU THINK ABOUT ALL THE EQUIPMENT NEEDED, THE EDITING SOFTWARE, APPS, ONLINE CLASSES, AND CONNECTIONS NEEDED TO CREATE SOMETHING. WE MIGHT FEEL PRESSURE TO GO OUT AND START PURCHASING AND BUYING. BUT FIRST THINGS FIRST, WE NEED TO GET CENTERED. CREATING CONTENT REQUIRES YOU TO CONSISTENTLY "WATER THE GARDEN". IT'S VITAL TO FIRST PRACTICE EXTRACTING CREATIVE JUICES AND THEN ONE MUST KEEP THEM FLOWING. SO THERE'S AN ART TO IT. YOU WANT TO TRAIN THE MIND FOR STAMINA, LONGEVITY AND PATIENCE. THE GOAL IS TO HELP YOU FIND WAYS TO KEEP THE IDEAS COMING! 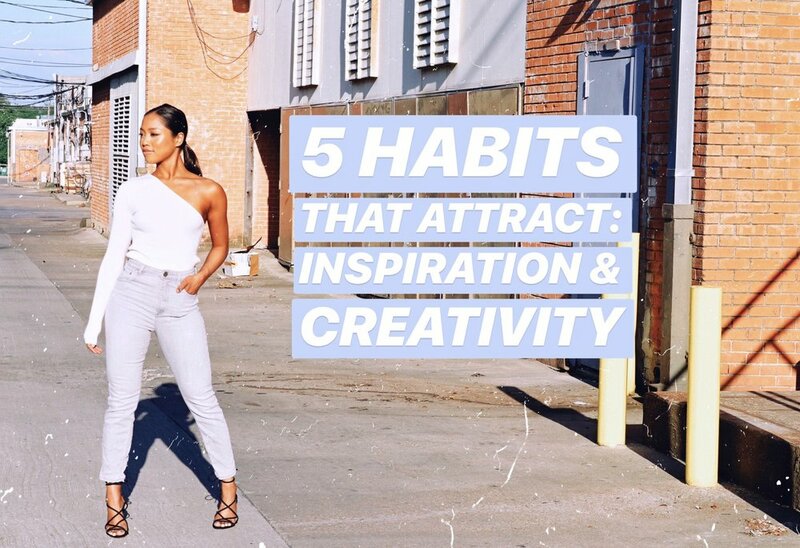 SO HERE ARE MY 5 TIPS FOR ATTRACTING CREATIVITY AND INSPIRATION! YOU'VE HEARD OF THE SAYING, "STOP AND SMELL THE ROSES." THAT'S WHAT I BELIEVE ONE SHOULD DO AS OFTEN AS POSSIBLE! SPEND TIME LOOKING THROUGH ART, TRY LISTENING TO NATURAL SOUNDS IN NATURE ONE MORNING. TASTE EVERY INGREDIENT IN A MEAL OR ORDER SOMETHING YOU'VE NEVER HAD! PEEL THE ORANGE A LITTLE LONGER, DRINK YOUR TEA EARLIER BEFORE WORK. THE GOAL IS TO SLOW EVERYTHING DOWN SO THAT YOU CAN FULLY EXPERIENCE SIGHT, SMELL, SOUND, AND TOUCH. OBSERVE YOUR SURROUNDINGS AND TAKE IN THE COLORS AND DETAILS. 2. USE YOUR LEFT BRAIN: TAKE A COURSE IN SOMETHING UNEXPECTED. AFTER I GOT OUT OF COLLEGE, I DIDN'T HAVE MUCH TO DO WITHOUT THOSE LONG SEMESTER ASSIGNMENTS! LOL SO I WOULD ENROLL IN VARIOUS CLASSES SUCH AS WREATH-MAKING, SUSHI-MAKING, AND FLORAL DESIGN. CHECK OUT YOUR LOCAL MUSEUMS OR BOTANICAL GARDENS SO THAT YOU CAN FIND SOMETHING FUN! IT WILL HELP YOU EXPLORE YOUR ARTISTIC + LEFT BRAIN SKILLS. THIS WILL BE IMPERATIVE AS YOU BEGIN TO SCHEDULE YOUR CREATIVE CONTENT. I USE TWO ORGANIZERS AT THE MOMENT, BUT FIND A SYSTEM THAT FEELS ORGANIC TO YOU. MAKE SURE THERE ARE PLENTY OF PAGES FOR NOTE-TAKING, IDEAS, AND DOODLING! THE MORE WHITE SPACE, THE MORE YOUR IDEAS WILL COME TO LIFE. 4. MAKE TIME FOR MEDITATION + DEEP THOUGHT. YES, AS CRAZY OR COMMON AS IT SEEMS, PULLING YOURSELF FROM THE DAILY GRIND TO RE-ALIGN AND FOCUS YOUR BRAIN WILL BE ESSENTIAL. TAKE A MOMENT TO FOCUS ON YOUR VALUES AND STRENGTHS AND WHAT YOU WANT TO SHARE WITH OTHERS. THIS WILL ATTRACT THE POSITIVE THOUGHTS AND ENERGY NEEDED TO PULL CREATIVITY INTO YOUR LIFE. IT COULD BE 5 OR 10 MINUTES OF JUST SITTING BY A WINDOW OR OUTSIDE. IT COULD BE PRAYER OR A MANTRA. WHATEVER YOU DO, GO INTO THIS TIME WITH AN INTENTION TO DIG DEEPER. AS CLICHE AS IT SEEMS, MOST OF OUR STRENGTHS LIE IN OUR GREATEST CHALLENGES, OUR DARKEST TIMES. WHAT IS IT THAT MADE YOU DIFFERENT? WHAT IS IT THAT MADE YOU AN OUTSIDER GROWING UP? TAKE THESE EXPERIENCES AND PUT THEM INTO YOUR WORK, BUILD THEM INTO YOUR CONTENT. IT IS THIS UNIQUE TRAIT THAT WILL ALLOW YOU TO STAND OUT AND WILL CREATE AN AUTHENTICITY ABOUT YOU. ASIAN PACIFIC AMERICAN HERITAGE MONTH: LET’S TALK CULTURE ON MY NEW SOUNDCLOUD!